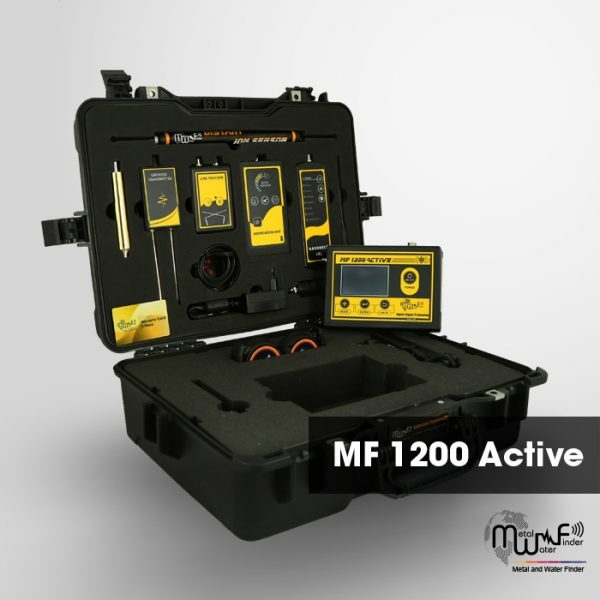 MF 1200 ACTIVE” Works on scientific techniques of special electronic character and by developed software and unique. Multi-detection and exploration systems with the latest advanced and sophisticated to techniques to detect and locate the targets underground. High technology levels to detection and exploration for underground resources and mineral, gold, minerals, water, gemstone, voids and treasures. Waves frequencies of high precision and performance, able to penetrate the subsoil to depth up of 40 meters, and the ability of detecting front distance and spread up to 2 km. Automatic Tuning System (ATS) Special invention and new, registered in favor of MWF GROUP, this system provides accurate results and certain in all types of soils and terrain, because the system recognizes the soil automatically, grants the search process automatic tuning commensurate with the type of soil and properties of soil , With the abolition of any overlaps radiation resulting by the rocky and mountainous territory effect , which may affect a lot of other detectors, but the this smart system, can sorting and analysis and provide the necessary levels which relates of frequency signal, voltage and wavelength of the signal which gives results free of any errors. TFT color screen 3.2-inch HD, gives the user the clear vision by night and day. Control the level of screen brightness feature, which gives you adequate lighting for day or night, and to reduce the level of lighting to save energy as well. Five levels of the sound gives you adequate control of sound output and signals sounds of search results. For the first time globally in the detection and exploration devices exclusively at MWF Group, The device supported with smart operating and detection systems, Smart interfaces, Power conservation system, Smart charging system, Multilanguage and remember device language, save settings, Smart control, Bluetooth technology and factory reset. Smart settings Interface, gives you a flexible and fast control in all the functions and programs with ease. Battery and charging smart feature, which gives the user accurate tracking of battery level and notices about battery level and alerts before the entry into force of power, with smart charging systems that give the user also follow up the battery charge when the device ON or OFF, and to find out the level of charging which added, all in real time. The device and accessories featuring by small size, which giving quick movement with wireless communication orders, and subject to dismantling and assembly of all units and systems attached. Wireless connection System, to connect with the accompanying search systems, which sends a wireless orders to search system which to be exploration by it and change its settings remotely, without the need to connect the wires and other things that may impede and delayed the search process and results. Teledetection Search System and working by two systems (two methods) for detection. Handheld LRL” works by long distance search system to detect the targets location, are guiding the user directly to the target site, with laser LED for guidance in the night. This unit operating on a 6-volt, through four standard AAA batteries 1.5 volt, can be used a normal batteries for once, or rechargeable batteries. Line Tracker system, a special system to track electrical lines frequency that’s connected between the main transmitter device and the target point, It gives the user an accurate track until they reach the point of target directly, with the latest advanced systems for remote sensing systems by wireless connection. Accurate results to detect the targets underground and to locate the target path before reaching it. Multifunctional and specialized lists in detection of targets underground / Metal list / Water list / Gems list / Voids list. Metals list specialized to detect 4 types of metals with a property to choose a desired target want looking for, It includes: gold, silver, copper, bronze. Water list specializes detects4 types of water with a property to choose a desired target want looking for, It includes: Natural water, mineral water, salt water, and all types of water. Gems list specialized to detect 4 types of Gemstones with a property to choose a desired target want looking for, It includes: Diamonds, emeralds, meteoroids, and all gemstones types. Voids List specialized to detect caves. Equipped with ground transmitter unit to signal strengthen. Working on a long-range Ionian search system, to detect and search for Ionian field of precious metals underground, and locate the targets location from far distance, it can be used also in the car. Ionic acoustic verification unit is working and connecting wirelessly with the main device. The system is characterized by rapidly responding to the underlying objectives and gives complete data about the hidden target. A great focus in the search to sensing the targets sites, and guides the user to the target site at less time and effort as possible. LEDs interactive Indicator, interacts upward whenever get close to point centre of targets. Sound interactive Indicator, interacts upward whenever get close to point centre of target. LEDs indicator of battery levels, and consists of 3 levels shows the battery level. 1. Metal list – Water list – Gemstone list in addition Voids list. 2. Metal list – Water list – Gemstone list in addition Voids list. 3. All metal and distinguish between them and voids as well. 40m for all targets and 450m for water with a control property in the depths level, through depths options list. 2000 m with a control property in the distance level, through distance options list. 1. Through orientation toward target location accompanied by sound + visual + alerts. 2. Through orientation toward target location accompanied by sound + visual + alerts. 3. Through sound, LEDs indicators and vibration.